Glenn Miller and his Orchestra got America “In The Mood”, but when his country needed him he was ready to give it all for his fellow servicemen. 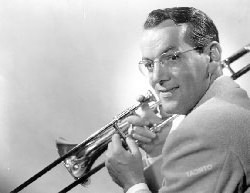 In fact, Major Glenn Miller was lost over the Channel on his way to set up shows for servicemen stationed near the front lines. Glenn Miller and his Orchestra is fondly remembered as not only one of the best of the big bands of the swing era, but most popular and best-loved bands of World War II. 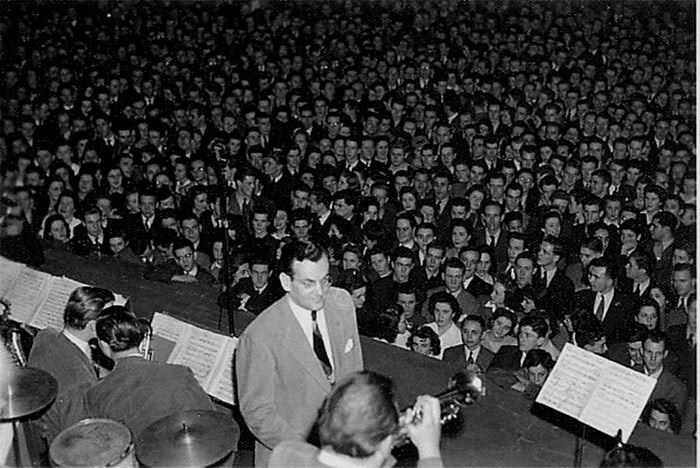 Formed in March 1938, the (second) Glenn Miller Orchestra was famous for several hits, including "In the Mood," and "Pennsylvania 65000." Their "Moonlight Serenade" radio series for Chesterfield cigarettes was on CBS three times a week. In 1941, it was off to Hollywood where the band worked on its first movie, "Sun Valley Serenade", which "Chattanooga Choo Choo." The war had begun, draft notices were being sent out, and Uncle Sam didn't mind taking musicians along with the rest of America's young men and women. On October 7, 1942 Miller reported for, and was assigned to the Army Specialist, allowing him to work on an army band to boost morale. The result was the Glenn Miller Army Air Force Band. It took a while to get the band on the road, but in late 1943 they were shipped out to England. In England less than a year, the Glenn Miller Army Air Force Band did over 800 performances - 500 were broadcasts heard by millions! There were more than 300 personal appearances including concerts and dances, with a gross attendance of over 600,000. In the Autumn of 1944, the band was scheduled to be sent on a six-week tour of Europe and would be stationed in Paris during that time. Miller decided to go ahead, in order to make arrangements for the group's arrival. On December 15th, Glenn Miller boarded a transport plane to Paris, never to be seen again. At first shattered by the news, the Band determinedly carried on in Miller's memory for the remainder of the war. Those who danced to it then will always remember Glenn's music, and enjoyed by those who listen to it today, as it is a perfect reflection of the spirit and dedication of America in the Second World War era. For more WWII listening, the World War II Collection, Command Performance, and An American in England are great listening. See also: Band of the AAF Training Command, The Chestfield Show (Moonlight Serenade). 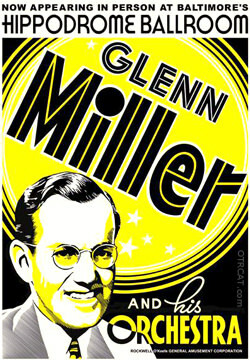 Glenn Miller has got to be one of my all time favourites.